Royal Air-Tight Food Storage Container 5-Piece Set Just $35.97! Down From $70! PLUS FREE Shipping! You are here: Home / Great Deals / Amazon Deals / Royal Air-Tight Food Storage Container 5-Piece Set Just $35.97! Down From $70! PLUS FREE Shipping! Score this #1 Best Selling Royal Air-Tight Food Storage Container 5-Piece Set at Amazon for just $35.97 down from $69.99 PLUS FREE shipping! Royal Air Tight Food Containers are modular, stackable, and designed to adapt to your food storage space. Though the heights of each container differs, the consistent width of each container makes them alignable and easy to organize. The plastic BPA-Free food storage containers are attractive enough to display on your counters, but strong enough to last you for years to come. And thanks to the airtight lockable lids, your food will stay fresh longer and retain its nutrients. These airtight canisters work equally well for liquids such as juice, soup, stews and sauces and because of the airtight seal; you don’t need to worry about spills. Awesome! VERSATILE – Store your favorite foods safely into these efficient containers. LIQUID-FRIENDLY – Not only are these good for dry foods, but our containers are great for holding liquids such as water, juice, soup, and more. Container corners allow for easy pouring. LID-LOCK MECHANISM – Once the ring on the lid is pushed down, the silicone seal inside the lid will expand to seal the jar, creating complete airtightness. PREMIUM QUALITY – Made from BPA free plastic, these containers have been tested to be durable and long-lasting. 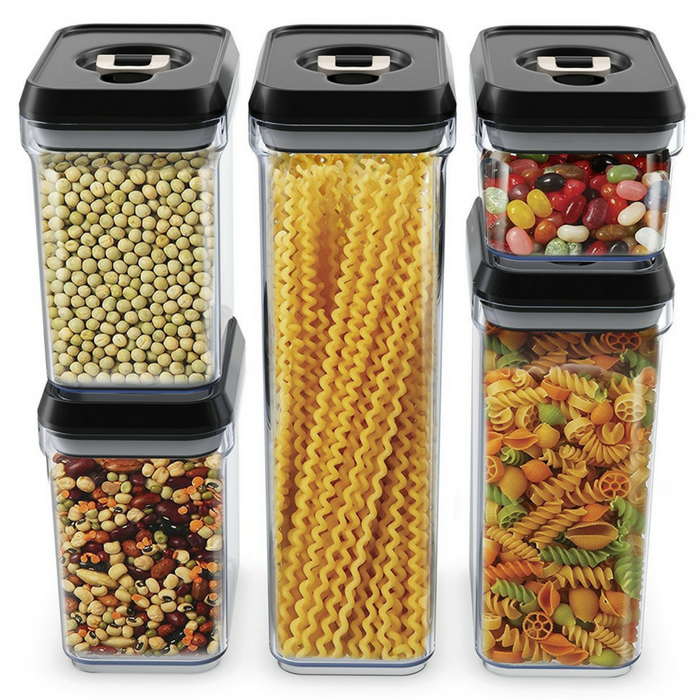 With a stackable and modular design, these containers will save you a ton of space in your pantry and cabinets for better kitchen organization.